Spoon Carving First Steps: The MaChris No 1 ....Arrives. The MaChris No 1 ....Arrives. 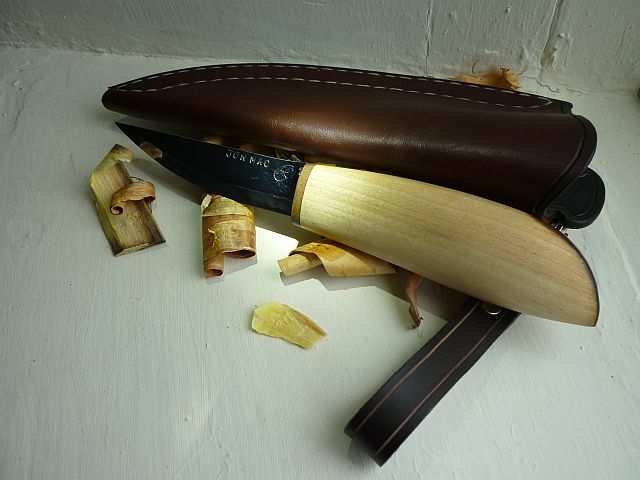 The collaboration between myself and Chris Grant has culminated with this beautiful and practical carving knife. Chris Grant has surpassed himself with a skilfully crafted knife. We briefly discussed this blade before deciding to design something from scratch, as I had specific ideas/specs that I wanted to realise. Also at this point Chris decided to put the handle on the knife as a complete job so it would be ready to use. I supplied Chris with a pre-fab knife blade in cardboard, as well as a roughed out handle blank. The main design feature worth noting is the tapering point, this was designed specifically for chip carving. Approx 3mm thick blade, not too wide to hinder carving, not too thin to be uncomfortable when thumb pressure is applied. 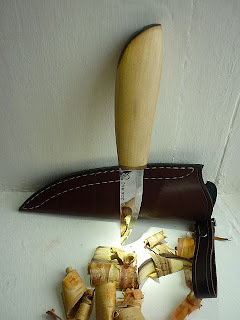 Simple carbon steel for the blade; easy to sharpen, tough and capable of a fine edge. A strong, narrowed tang to allow for the pressure of power cuts. 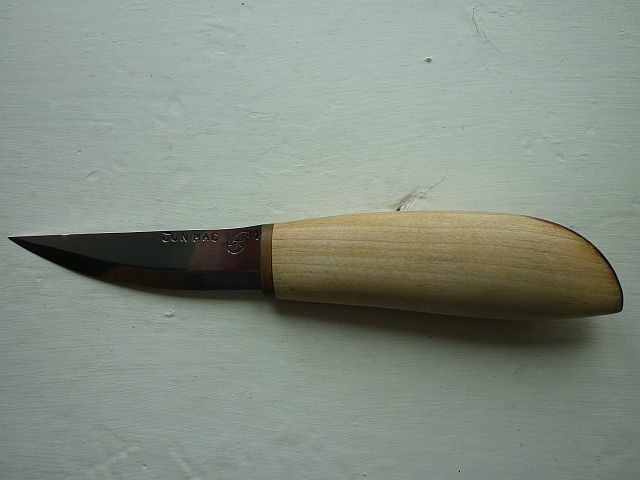 A well designed one-piece warm wooden handle. The prototype was made in laminated CS80, but needed refining, another version was made in laminated shiro gami 2 (white steel) for comparison purposes. Chris hopes one day to finish both these knives, so a full comparison can be made. 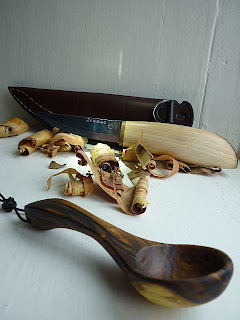 The first full working knife was made from 15N20, band saw steel, with 2% nickel, very sharp, with great toughness, it was decided that this would be an ideal steel for a blade with a very fine tip. The blade was heat treated in a computer controlled furnace, to ensure maximum performance from the steel and then quenched in reclaimed whale oil. Jon carved the final handle himself, to ensure that it would be exactly as he wished. 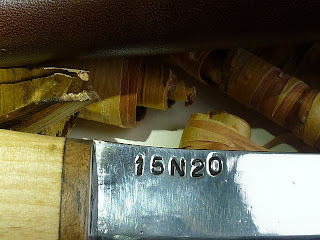 The blade was secured in the handle with super strong two part JB weld epoxy.To finish the handling, the tang was peened over the end of the handle. 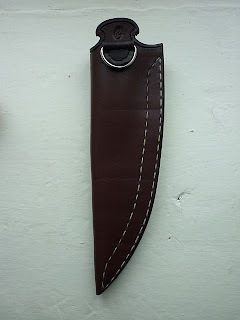 The sheath was made to be hung on a shoulder sling, but can adapt to belt carry. 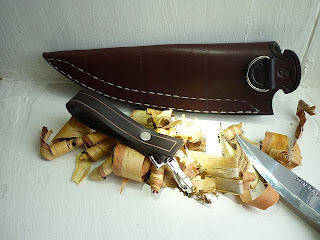 The sheath is stitched with two rows of thread with an extra thick welt 8mm to allow for the blade's sharpness & fine point. Sheath: Oil tanned leather, sealed with beeswax & gum traganth, sewn with white waxed linen.. 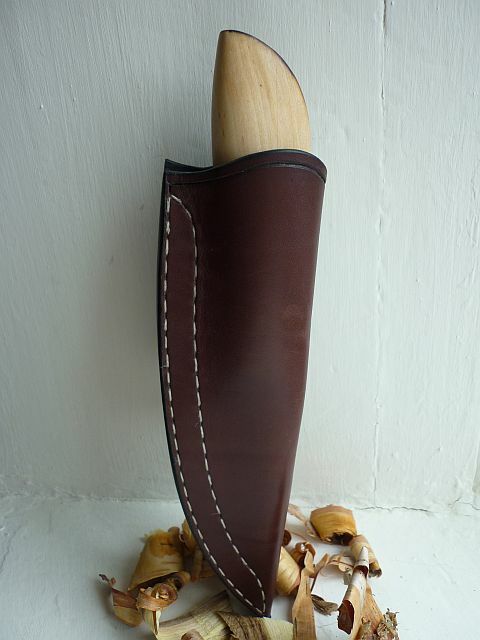 Handle: Hand carved Birch with Walnut ferrule.